Numerous studies have found that people of color, women, and those with physical challenges are significantly under-represented in political careers due to societal barriers. For example, women’s participation in politics shows some improvement while women occupy only 12% of the political careers. To explore whether students and professors interested in political careers have experienced under-representation of minorities, a mixed-method approach with both surveys and interviews of Minnesota State University, Mankato, students and professors from the departments of Government and Gender and Women’s Studies were utilized. These students were selected because both fields study political institutions, and are likely to seek political careers. Research findings support the hypothesis that minorities experience obstacles in the process of obtaining political careers. In addition, professors who work in political careers described a lack of support to maintain their career. This study has implications for raising awareness about the obstacles that people of color, women, and those with physical challenges face obtaining and maintaining political careers. Building upon a wealth of research, our findings will challenge our society to lay prejudicial barriers to rest and provide greater equality for all those seeking political careers. If accepted to both conferences, both authors will have the opportunity to represent the research as first author. Barr, Chelsea and Ina Pae. "The Under-Representation of Minorities in Political Careers." 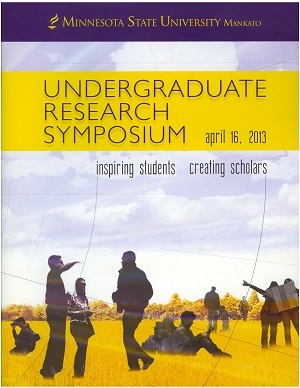 Undergraduate Research Symposium, Mankato, MN, April 16, 2013.